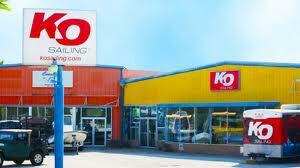 Join KO Sailing Saturday April 14 (9am-3pm) 2321 Nasa Parkway Seabrook, TX for the Grand Opening Celebration! Check out the new inventory and meet other sailing enthusiast! 10% discount on merchandise some exclusion apply. KO Sailing has a new owner, new location and an inventory bigger than ever! ~ by Floyd on April 10, 2012.